SAC Colvin, (L kneeling) with agents & detectives. 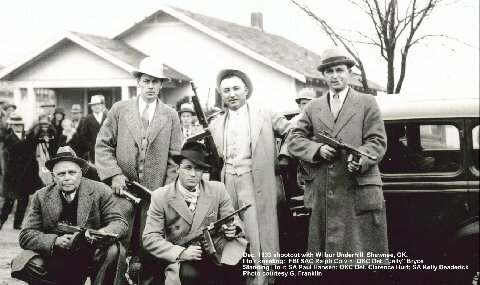 (see our photo gallery with this)The 1933 shootout with Wilbur Underhill and others at Shawnee, Oklahoma is one of the classic interaction cases of the FBI working, in this case, with Oklahoma local lawmen. Agents present with Colvin and others were: SA's Frank Smith, K. D. Deaderick, Paul Hansen, J. M. Edgar, T. M. Birch, and George H. Franklin.